Oreo Cheesecake Cupcakes are delicious individual portion of cheesecake loaded with Oreo chunks topped with chocolate ganache. The first time I made these delicious Oreo cheesecake cupcakes, I realized it was a bad, bad idea! The thing is that my husband, who by the way has a sweet tooth, went completely crazy about these cute cupcakes. I have to admit that even I’m not indifferent towards this heavenly treats. But to make it every ten days is no pleasure at all! A few days ago, after no more than two weeks since the last time I made these cupcakes I heard the hackneyed phrase: “Vera, when are you planning on making those little, white cupcake goodies?” What was I supposed to do? Nevertheless, in order to avoid turning this activity into a run-of-the-mill job, I decided to spicy it up a bit. If you want to turn something already tasty into something even more delicious, chocolate and Oreo cookies are a perfect choice. Reese’s Chocolate is also an excellent choice, as you can see here. So, before baking them, I placed one Oreo cookie at the bottom of each cupcake and added some crushed cookies to the cheesecake base, mixing everything together. Finally, I topped this fantastic delicacy with perfect chocolate ganache. Can you imagine what the reaction to these little Oreo- cheesecake cupcakes was! “OMG, this is absolutely fantastic!” In a blink of an eye, a plate with 12 cupcakes was already empty. So if you are in need of a quick and simple treat for your guests, who are about to arrive, or you just want to sweeten your day, remember- cheesecake and chocolate and Oreo are a perfect combination. But be prepared that you’ll be asked to make them again in no time! Preheat oven to 300 F. Line standard muffin tins with paper liners and place 1 whole Oreo cookie in the bottom of each cup. Beat together cream cheese and powdered sugar until it’s smooth. Add eggs whites one at a time and mix until combined but use medium speed and do not over mix it. Add pinch of salt and mix. Bake for about 25 minutes (untill the centers apear set and the toothpick inserted in the center comes out clean). To make chocolate ganache, melt the chocolate and stir in the heavy cream until combine evenly. With a spoon spread the ganache over the cooled cupcakes and let them cool completely at room temperature before store them in the fridge. Should the chocolate chips be semi-sweet or milk chocolate? Thanks! Dear Mallory, I use semi-sweet chocolate,because the cupcakes are already sweet enough by them selves, but you could use milk chocolate either if you prefer. Vera, I just made these cupcakes & they look delicious, but I have not been able to put the ganache on top because I have not been able to get it right. I melted the chocolate & added the cream, mixed it & it just wont mix right. Its got chunks of chocolate & wont smoothe out. What have I done wrong? Hi Cindy, you probably didn’t melted chocolate completely if you got chunks.You can bring it back in medium sauce pan and melt it together with heavy cream on low-medium heat(stiring constantly), then remove from the heat and let it cool to room temperature before spreading over cupcakes. I hope this will help. Those that are having issues with the ganache….if you boil the cream first and pour it OVER the chocolate it will melt smoother and faster. You only bring the cream to a boil than take it off. your chocolate will be in a bowl and just boil the cream over, give it a few seconds and start stirring, you will see how quickly the melting happens. Are these supposed be kept refrigerated if I make them the day before? Pack them in the fridge and you can keep them for a few days. Why do u use egg whites. Can I mix egg whites separately till stiff peak before adding to d cream cheese mixture. Appreciate yr comment. I use only egg whites for these cheesecakes cupcakes because I want them to stay white. When you add egg yolks cheesecake might turns out a bit yellow, and I want to keep the white color as a contrast to Oreo. I’ve never try to add beaten eggs in cream cheese filling, so I don’t how it would works. When you use the over beaten egg whites (Like for a margarine for example) It causes your cheesecake to fall apart during the baking process, and the egg yolks make the baking inconsistent through out the cupcake. Picture a hard boiled egg, or even a fried egg, the yolk always comes away thicker then the whites, because of the protein within the yolk. Your always best using the egg whites only, and do not beat them into peaks, mix them with the cheesecake mix to ensure the smoothest cheesecake possible. (This is the same for both Large Cheesecakes (Which I am hoping to make a large base cake with this receipt idea) or mini/muffin cheese cakes. Soooo good!!! And super easy to make! These look SO amazing….I would love one right now! 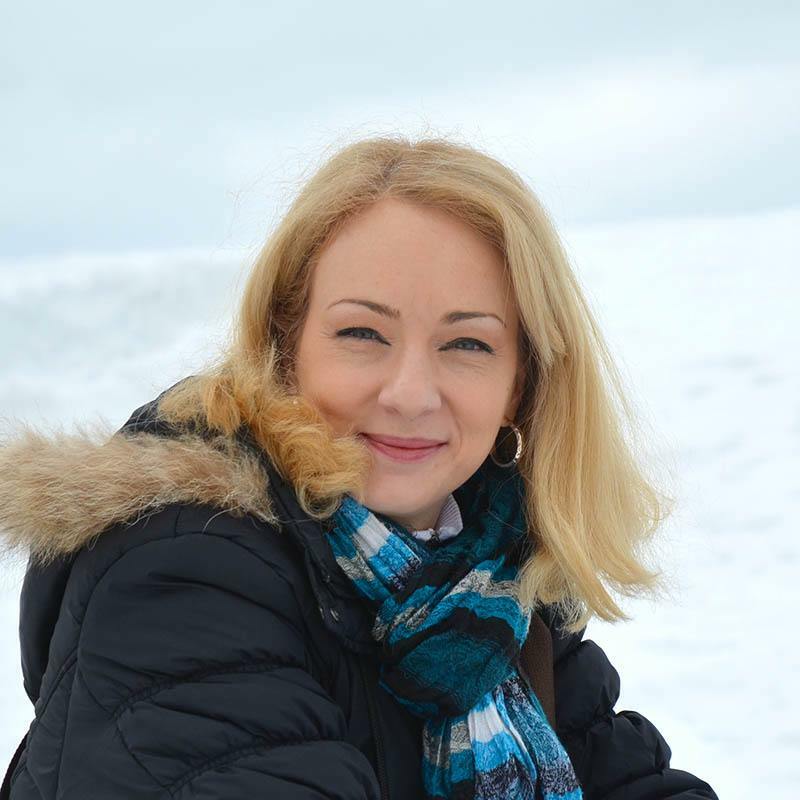 Thanks so much for sharing at Saturday Night Fever – you’ll be featured by me tonight! Thanks a lot Cathy, I’m so happy about that! Scrumptious and super tempting cupcakes! I saw these on face book but no one had the recipe so I researched it and found yours, they are in oven now! Thanks! I hope you will like them . They were yummy but this time am going to try 1/2 of cookie on bottom! Can this be made as one large cheesecake, rather than individual? I’ve never tried but I think that it could work as well. Let me know when you try. When you turn the cupcakes upside down … Would you be able to see the word ‘Oreo’ printed onto the paper from the cookies? Hi Tae, yes I ment the chocolate chips, and Oreo stays at the bottom of the cupcake so you could see it. Also , you said melt the chocolate .. Do you mean the chocolate chips? Hi Fareeba,you can use ricotta cheese. I got so excited when I found your recipe! I’m baking them now, and can’t wait to dig in! Thanks. Valerie, I didn’t have trouble with that, when the cheesecake were cooled I peeled them easy, maybe just a few crumb stay on the paper. heavy cream is not available where I live, are there any substitutes such as extra thick double cream? is it also possible to use soft cheese instead of cream cheese as I cannot find this in any local store? Hi Shay, you can use ricotta cheese, and double cream but be careful it is more dense than heavy whipping cream. I couldn’t get it to set :-/ I have been baking for half and hour and the cheesecake still looks like pudding… I don’t know why because I followed the instructions to the dot, could someone enlighten me? I realy don’t know what went wrong with your cheesecakes, maybe you mixed the cream cheese and eggs more than it shoud and the batter become too thin. I had to cook mine for 40-50 mom before they set… ? Can you help me to change them to gram? Hi Anastasya, you need about 100 grams powdered sugar, 450 grams cream cheese, 60 ml heavy whipping cream, 45 grams chocolate chips plus other ingredients in the recipe. Mine too took longer than the 20 minutes. My batter was thick, used a cookie scoop. Might be my ovens, they are new, but I think next time will increase the temp to 325 and see. They look awesome and can’t wait to try. can i know the meaning of 1 lbs of creamcheese?? ooohhhh btw,can i use all-purpose cream than heavy cream? I can’t answer you that because I’ve never tried it. I have them in the oven now and they do not look cooked. Are they supposed to look cooked or pass the toothpick test? Hi Janna, they shoud apear set, or the toothpick came out almost clean. Hi Silka,you don’t have to beat the cream first, just stir it well in melted chocolate, and ganache will thicken when it’s cooled. Probably you melted chocolate in a very high temperature, and it turns out runny. Before you start spreding it over the cupcakes let it cool, stiring occasionaly, until it starts to thicken.If this did not help, then try the next time to use more chocolate and less heavy cream and do not overheat the chocolate. Yes it’s 1 lb of cream cheese or 16 ounces. Just made these and they are so good! They did take a little bit longer than the 20 minutes! 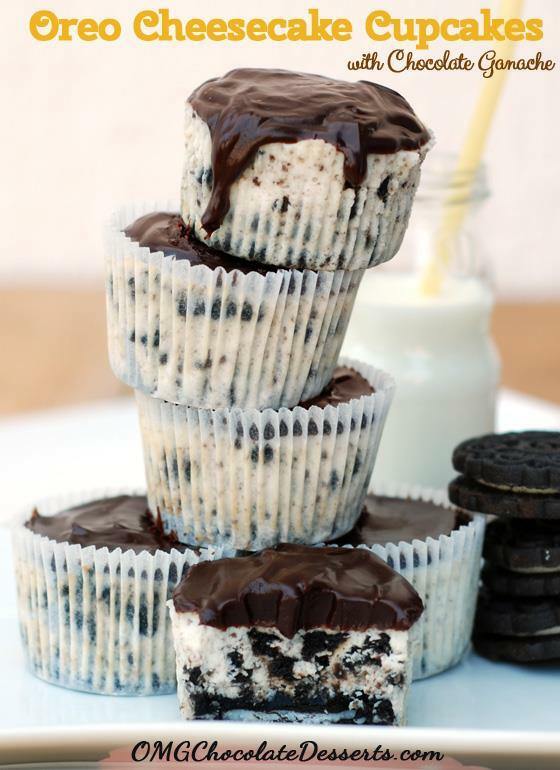 I may try using the mini Oreos and make mini cupcakes next time! Thanks for the recipe! Hi I just made these and they look great! My first attempt was an oopsie as I didn’t read the directions clearly and just uses 8oz cream cheese because im so used to using just one stick with other recipes I make. But did it again and their awesome, my only question is: as I left out the chocolate garnish, could you tell me why melt the chocolate qith heavy cream instead of just melting it in a double boiler…Ive never used heavy cream; does it just make the chocolate taste a little better done your way? Next time I will probably use the chocolate but was actually thinking of using white chocolate chips as this desert reminds me of Oreo cream cheese balls I make around the holidays…the white chocolate is super rich but so delicious they go fast! Hi Clinton, white chocolate sounds as a great idea for this recipe.I did not understand do you ask why is heavy cream used, or you are not clear the method how it is made. It is used because it’s (at least to my taste) ganache tastier than pure melted chocolate. I melt the chocolate and then stir in heavy cream, because the cream cools the chocolate and make ganache thicker and easier to work with. I had these at my Nephews Wedding and have been asking for the recipe for months, My Niece In Law (?) (She is awesome) it was her relatives that made them but they are from out of town. Thank You! I am hitting the store in the morning to buy the ingredients. Then this will be my cheat meal for this week. Look out diet. Hee! Hee! Do you think these would freeze well? They look great and I would like to make them 2 weeks ahead of time for an event. Think that would work? Some cheesecake recipes call for sour cream and vanilla. Have you ever tried adding any of these to this recipe? Hi Crystal,I have never tried, as for the vanilla think it is not necessary because they already have a pronounced taste thanks Oreo and chocolate ganache, but you could add it it would be Ok too, and I like the texture and taste of these cheesecakes so I would not add sour cream. If you try let me know how wit turns out. Ars these to be stored in the fridge? Does the Oreo on the bottom stay crunchy or does it soften when after baking? Hi Mary, it’s something in between,it doesn’t stay completely crunchy, but it’s not too soft. Yes Mary, let them cool. Hi Jason, you can melt the chocolate using a double boiler. Hello there, these look fantastic, can’t wait to try but I do wonder if you could use a no bake cheesecake recipe or does baking it soften the bottom cookie? Hi Valhalla, baking does soften bottom cookie a bit. I made them and they aren’t sweet enough for me and also they are extremely chewy.. what do you think I did wrong? Hi Ash, the batter doesn’t need to be liquid, it shoul be thick but not too thick (not like cookie dough). Made these tidal! Turned out great! Thank you so much fir sharing thus with us! Do I have to use cupcake tins? I really do not want to run back to the store…. Hi Heidi,you’ll need cupcake or muffin pan. OMG! So good…making another batch today. I am also having a very hard time with the cooking. At 25 min, it was hardly cooked at all. I am at a higher elevation so I don’t know if that matters?? These did not work out for me and I was disappointed with the results. I have made many mini cheesecake recipes, but this one never came out creamy, as it should. I suggest using the 2 eggs (including the yolks..not just egg whites), as well as 1 tsp. vanilla extract. I would also suggested increasing the temperature to 350. Do you have any alternatives for the frosting/topping? I am going to try these later this week for a co-worker’s birthday and want to make sure it’s not too sweet. Thanks, they look yummy! Did these and they came out awesome! I used a little bit more oreo chunks on mine just cause i like my cheesecake with more texture. & with the ganache, i added a shotglass of vodka. Haha! Awesome recipe! Thank you! HI Danette, you can bake this as mini cheesecakes, but I suggest regular muffin tin(not mini). I can tell you how long to bake them, but if you use mini muffin tin, star checking them after 10 mins. Came here via someone’s Pinterest entry. These cupcakes look amazing! where in the receipe i use the chocolate chip?! Hi Batel, you should melt chocolate chips and combine it with heavy cream to make the ganache. Vera – Thanks for the recipe! Can’t wait to try it. You are extremely patient with all the redundant questions. Hi Vera, I am planning on making this and I was wondering if you have to spray the cupcake paper with cooking spray or anything before baking? This looks and sounds amazing! I can’t wait to try it. Thank you so much for sharing! Hi Taylor, I didn’t spray the cupcake paper. These are amazing and so simple my three yr old was able to help. Thank you!! These are terrific cupcakes!! They are mouth-watering. this account is taking pins and change the source! this is common on Pinterest. I am glad you liked the recipe. Can you use the mini cup cake trays and maybe crush the oreos on the bottom? Hi Jen, you can try that or use maybe try to place hlved mini oreo on the bottom. I plan on making this weekend. Very excited as we have 4th of July at my house. But I do plan on testing with the people I work with first. But just wanted to know do I put the Oreo filling in the cheese cake mix or just the cookie part? You may have answered already and I apologize for asking if you already answered this question. Hi Cathy, you should put both filling and cookie part in the cheesecake mix. Made these for a gathering and OMGEEEE is right instead if semi sweet chocolate chips I used white chocolate and it was delectable!!! A definite crowd pleaser! Just checking to be sure ….. this recipe calls for confectioner’s sugar and not granulated sugar??? Hi Myra, yes it’s confectioners sugar, it gives slightly different texture to the cheesecake filling than granulated sugar. I found these earlier today and am making them for a company luncheon tomorrow!! I can’t wait to try them!! ?? Hi Janet, they should taste like cheesecake filling not like the cake, and they are flat not puffed like cupcake. Can you use foil cupcake cups? Hi Jill, you can use foil cups. These cupcakes look so good cant wait to make them ..How much cream cheese is a pound of cream cheese? Thanks !! Hi Paula, 1 pound is 450 grams or 16 oz. Came across this recipe the other day & decided to try it, it was a HUGE hit in my home! They are already asking me to make somemore! Looks like I will have to double it this time being they didn’t even last 24 hours! I made them with pumpkin spice Oreos and they were so good. Added some cinnamon and pumpkin pie spice to cheesecake mix. Thanks for the recipe! Hi can i use white chocolate chips instead? Have you tried this with Mint Oreos? That’s the hubbys fave! Can you use white chocolate chips with the cream the same way for a white chocolate ganache? Hi Jen,I haven’t tried but if you do,please let me know. I made this for my dad and son’s combined birthday celebration. It seems as though everyone enjoyed them, however, I personally thought I would make a few changes. The cheesecake on this is very dense, so next time I will whip my egg whites stiff and then fold in, creating a lighter, airier cheesecake. Also, we had some leftovers of this since we had 2 cakes for the celebration. The following day, the oreo cookie on bottom was soggy. Yuck! I will do them in the food processor next time and make a crust out of them, hoping to avoid sogginess. The cheesecake seemed a bit dry, so I will do a water bath hoping it helps. And lastly, for some reason, my cheesecakes didn’t have the generous amount of ganache so I will increase the amount of chocolate. Great idea and thanks for the inspiration! This is very good treat. But info for ganache: NEVER melt chocolate first. Always heat cream to boil and pour over chocolate. Check any culinary book for correct procedure, it guarantees chocolate never to seize and always perfect. Also with cheesecakes higher heat will cause cracks, putting a pan of water in bottom of oven while baking will also prevent cracking. Just made these tonight and they ate amazing, the husband loves them! I’m going to try to make one big cheesecake with this recipe for Christmas dinner! I followed the recipe and used egg whites, but mine were brown. Your picture shows white with the Oreo cookies and it’s very pretty. The batter turned brown very quickly, maybe my pieces of cookies were too small. I’ve made these cupcakes several times. My cousin found the article on Facebook and demanded I make them. Greatest idea ever. My family asks for them all the time. I’m about to make for a going away party for my niece and her kids.